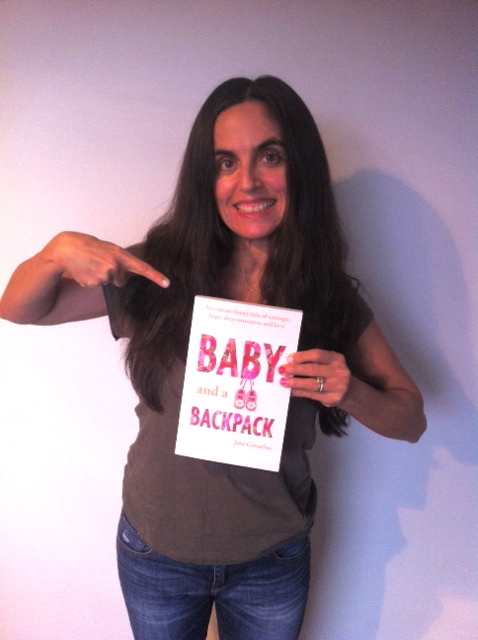 If you want to use my book Baby and a Backpack for your book club or reading group – thank you so much! Here are some questions you might like to use. Which of Jane’s personality traits helped her deal with her childhood? Do you think they also helped her on her journey? How do you think Jane’s relationship with men was affected by her relationship with her father? What do you think of the Dazzler? Would you consider Jane’s decision to take Poppy around the world – a responsible parenting decision? When Jane tells stories of her childhood, which story stands out for you the most and why? If Jane’s mother hadn’t become ill, what kind of mother do you think she would have been? Which character stood out the most for you and why? 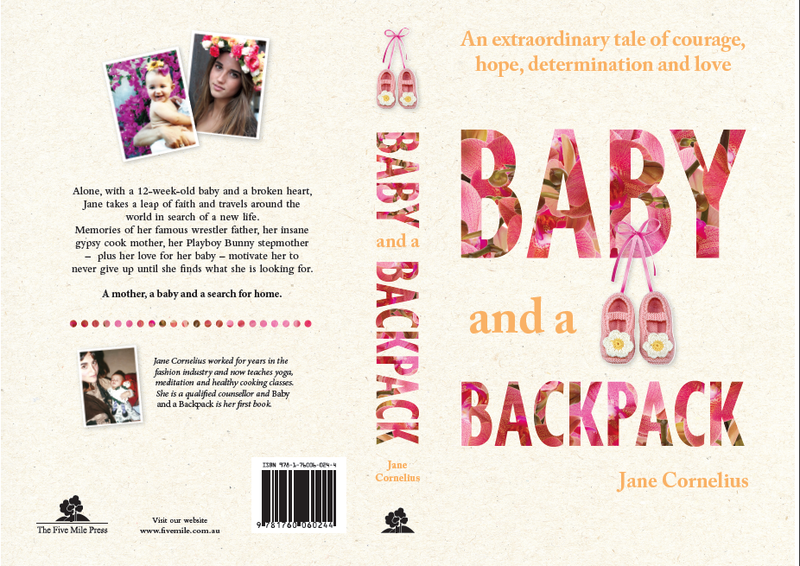 Jane experienced a transformation from teenager (wild child) to mother to woman. Do you think this transformation happens (and in that order) to all females? How do you think living in Bali affected Jane’s life choices? Did the ending turn out the way you expected? How did you feel about it? How did reading the book affect you? If you had no limitations, what would you do with your life? Living in Bali before I met The Blonde. At the airport with a 12 week old baby and an around-the-world ticket. Poppy in the English Countryside helping me to garden. The Dazzler, my father when he was a wrestler. Me, a wild teenager living with my mother. Rosemary, the kind lady who helped me in England. Poppy’s Nana Helen; such a wonderful woman. I got to see my brother Dax again in 2014. Sadly I do not get to see him for years at a time because we live so far apart. Dax and Kay together again too. The baby shoes I had made for the front cover of my book. I not only move countries, but also blog websites. I went to WordPress.org ( not sure why really, but I got told I should) but, then I came back! 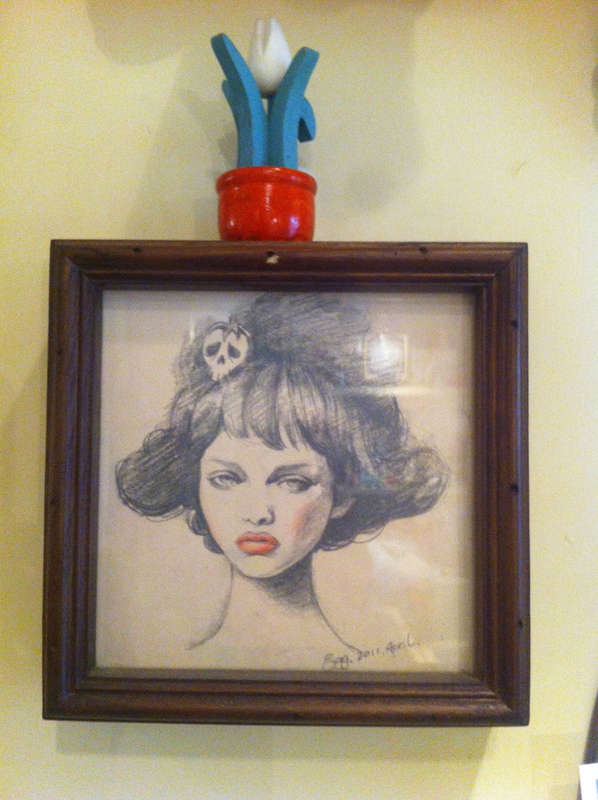 You will always find me at www.janecornelius.com and now here all the time. It was a holy moment and I had to film it. Here is the link, click on it below! 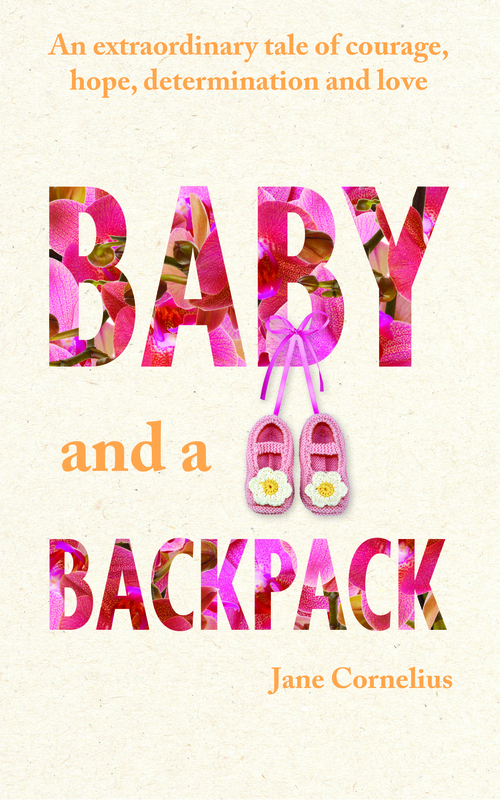 Here is a sneak cover preview of my book: ‘Baby and a Backpack’. It will be released in Australia on April 24th (perfect for a Mother’s Day gift). It will be available digitally and though Amazon. Click on the book cover image. It will become really big – so you can read the back cover. Me, the first time I saw the cover! Hi, if you live in Shanghai these are the latest healthy cooking classes I am teaching in August & September 2013. Contact me for further information here or on my Facebook page. Classes run most Thursdays 11.30 – 2.30 ish. Learn how to make vegetarian bean dishes, rice dishes (made from vegetables), salads, dips & dressing, deserts. All recipes: vegetarian, wheat, gluten, sugar & dairy free. Cooking 2: Italian Pastas & ice creams – Thursday 5th Sept. Learn how to make pastas (from vegetables), fresh sauces, sweet & savory toppings and ice creams. All recipes: vegetarian, wheat, gluten, sugar & dairy free. Learn how to make nut milks & all about sprouting nuts. Almond & flax bread and how it can be easily transformed into banana bread, carrot cake, walnut and date bread. Chia fruit & coconut porridges & fruit pie. Soya yogurts & soya chocolate pots, super charged smoothies. All recipes: vegetarian, wheat, gluten, sugar & dairy free.Healthy Kitchen Basics – how to turn your fridge & freezer into a healthy fast-food haven. Learn how to make chickpea delights, Lettuce-cup salads, dips, sauces, baklava. All recipes: vegetarian, wheat, gluten, sugar & dairy free. All recipes: vegetarian, wheat, gluten, sugar & dairy free. 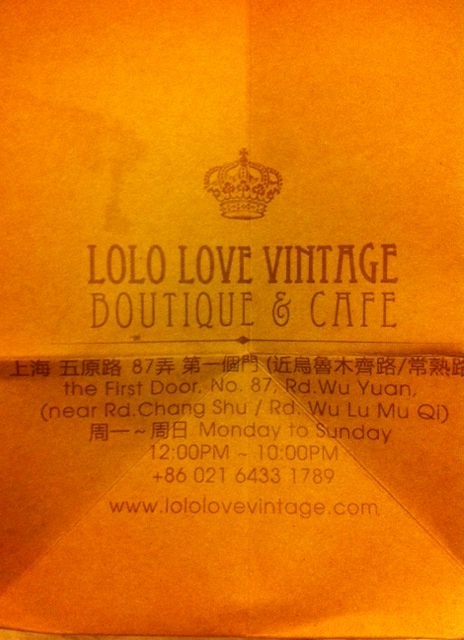 If you love vintage and quirky – you will adore this new shop ‘Lolo Love Vintage’ in Shanghai. It’s in a great street with el Coctel bar opposite ( open only at night) and Nene for a delicious Italian Lunch or supper. If you want to party The Apartment is right across the road too. Stay in a great hotel! Beijing is cheap with heaps of 5 star hotels virtually empty, so you can get a great rate and it will take your mind off the pollution. Go on treat yourself – you deserve it. 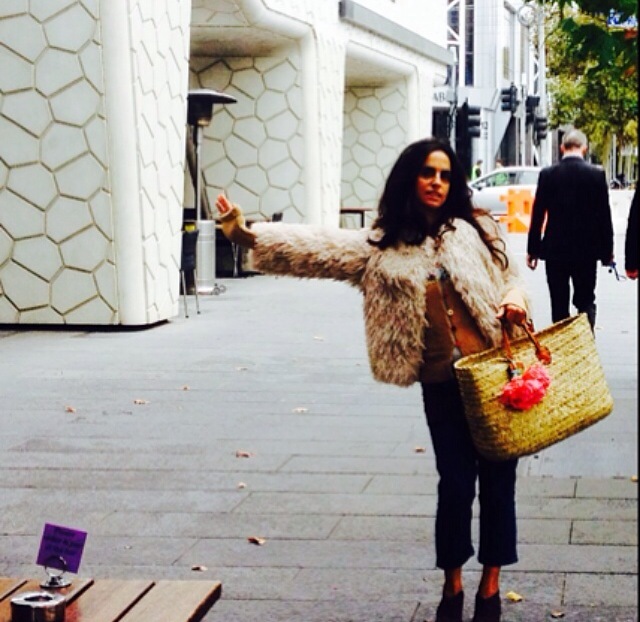 We stayed at the Sofitel Wanda. Eat fabulous food! including a Beijing duck, you must go to Da Dong. It’s a fantastic yummy restaurant. Try to book a table around the fish ponds and duck ovens. We had duck, delicious vegetarian dishes, champagne and cute deserts that looked like dandelions and it all came to under $60 U.S. That’s another bonus about visiting China: the food is great and cheap so, you can live like kings on workers wages. Do some web research and find other restaurants to go to before you get there. The link I made for Da Dong, has other great global and Beijing restaurants in it too. Time Out is another good resource. Walk the wall. Stay at the Commune By The Great Wall for at least a night if you have time. They have a shuttle that can pick you up from town. They have yummy, delectable restaurants, Chinese and western. The rooms are pretty cool and they have a private access to the wall. They will organize a picnic for you and you can go early morning and use it as your step work-out. The Aman in Beijing is really nice too if you have more money to splash around. Otherwise beware, if you do an organised wall trip: there are millions of tourists traipsing it. We passed sections of it that looked more like a trip from hell covered in people looking like ants, rather than the fun experience it should be! At the Commune, you will find no one, just you and the lonely stone steps and you will find your mind tripping off into fantasies of history. 798 Art District is a must: Dashanzi 798 Art District. Even if you are not that interested in art, it’s fascinating to see the old working factory area blended together with new art galleries, shops and quirky cafes. There’s heaps to do, look at one art gallery after the other, do some shopping and buy unique alternatives gifts, have lunch… Great for a whole morning or afternoon. Silk Market. If you have time, go and buy some funky pearls. I love the ones that are huge and colored. Make sure you bargain. Start by cutting the price in half. It is so cheap your going to be jumping with joy with your new found treasures. 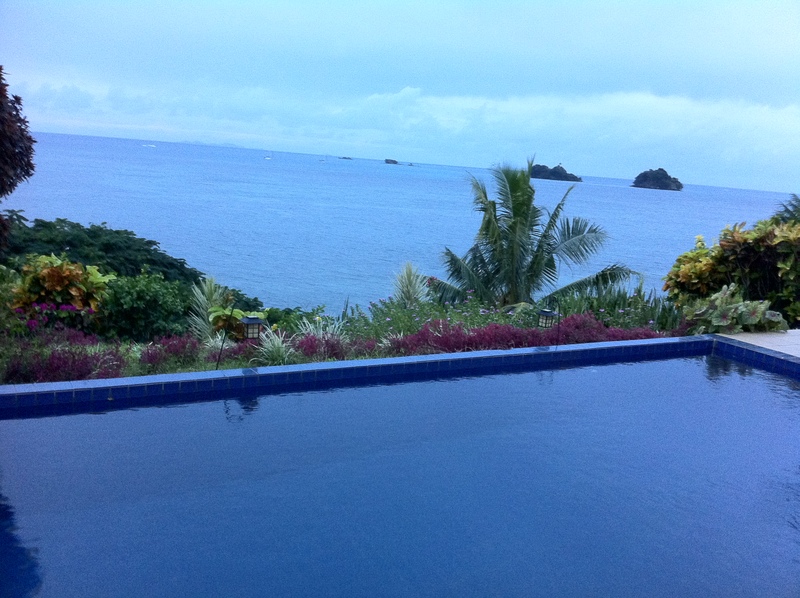 I’ve traveled to a a lot of places in the world and now: Taveuni in Fiji is one of my favorite destinations. It’s heaven on earth. When I research for a holiday it normally takes me a couple of weeks: going on the internet, finding chat lines, falling down internet-worm-holes, contacting my global crew of friends for tips… and this time the info I kept getting was: “Go to Fiji and if you go, make sure you get off the main island. Go to an outa island and see the real Fiji.” Taveuni, the garden Island kept flashing up again as the place to go. So, I rented a cute house with a pool (that didn’t cost a fortune) Villa Sekoula, but you can find other accommodation here. Here are some pictures from my holiday. Bulla, our helper in the house will take you into town to buy food which she will then cook. This fresh fish was about $5. We found eating in restaurants in Fiji really expensive for a family of four, so Bulla cooked at home for us ( cooking included with the house rental). Below was a market stall in town to buy fresh fruits and vegetables. 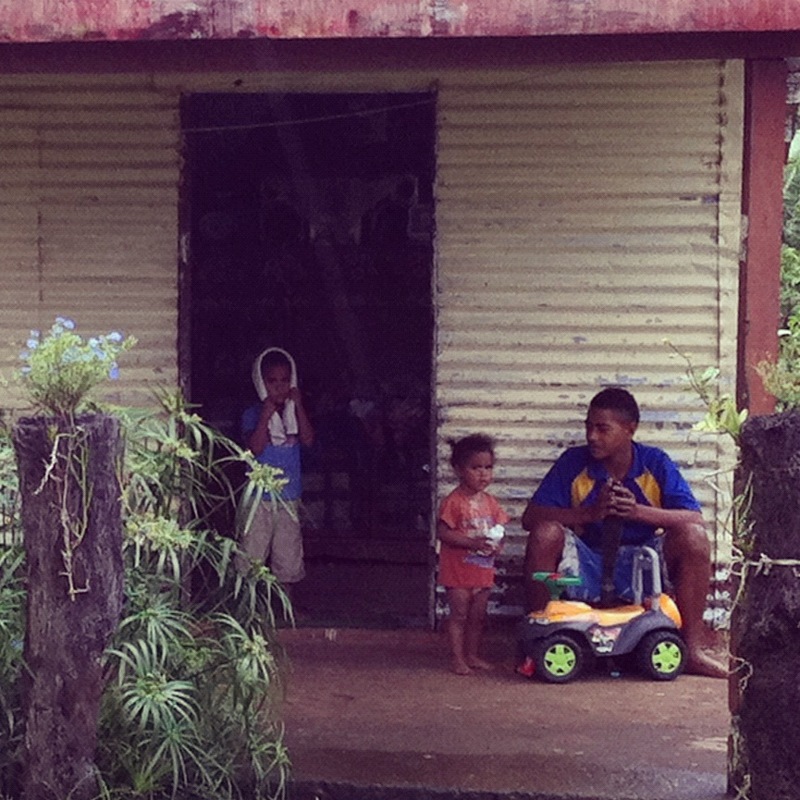 Everybody grows their own vegetables in Taveuni; it looked like people popped into town to sell their extras. 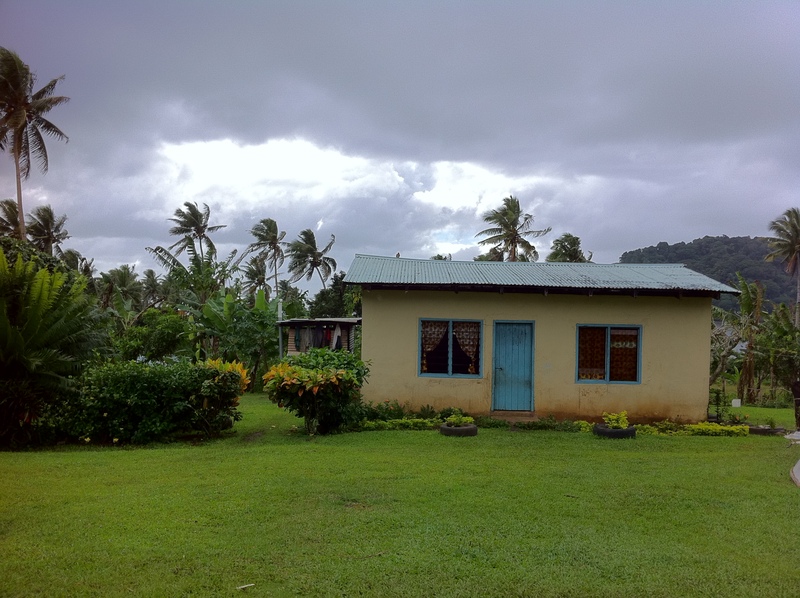 There was so much to do in Taveuni apart from sitting on a beach. There were so many magical waterfalls to visit and – no one was there! Below is a couple of pictures. The bottom picture is a natural rock-slide that falls into another waterfall filled with other happy little fish. (Make sure you get a guide that will show you how to navigate the slides and jump into the pools.) Cino helped us out and he was a good taxi driver too. TEL: 9846899. 2. 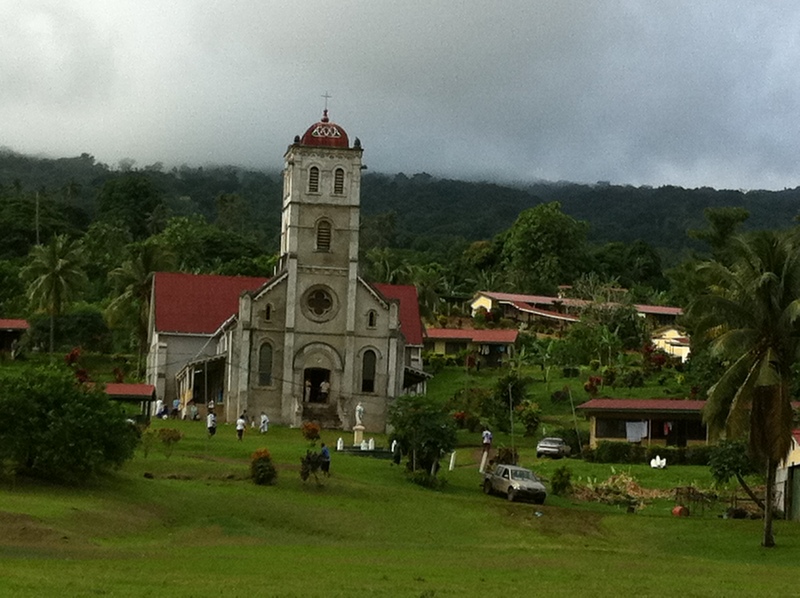 Wairiki Mission: If you are on Taveuni on a Sunday – this is a must! I’m not religious but sitting crossed legged on the church floor listening to everyone singing stunning a cappella hymns, was a truly a religious moment. Near here is the International dateline marker. A dateline cuts right through Fiji. To make life easier though – they have put Fiji, all on one time. If you go, it is the only place in the world where you can place one foot in yesterday and one in today. 3. Lavena Coastal walk: You walk through a local village, along a stunning coast line and arrive at another magical waterfall. You have to swim up a shallow river to get to it. Take a guide, they will show you how to jump into the waterfall and maneuver your way onto another, natural, stone water-slide. Take a snack, get your guide to bring a fresh coconut to share. Another thing you can do from here is take a boat or canoe up the coast to view more waterfalls. There are heaps of other things to do too and I wished we had spent two weeks there instead of 8 days. 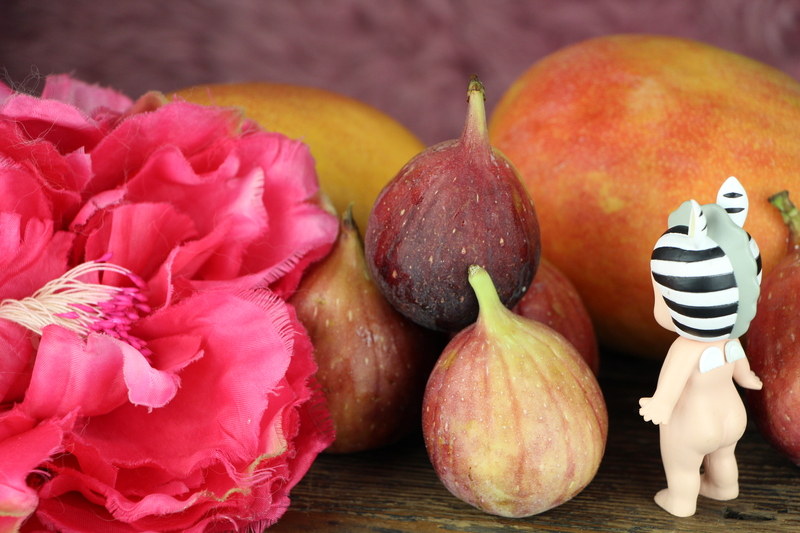 You can go horse riding, diving and pick a sacred flower: The Tagimoucia. They grows in only two places on the planet, Taveuni and a mountain top in Nepal. 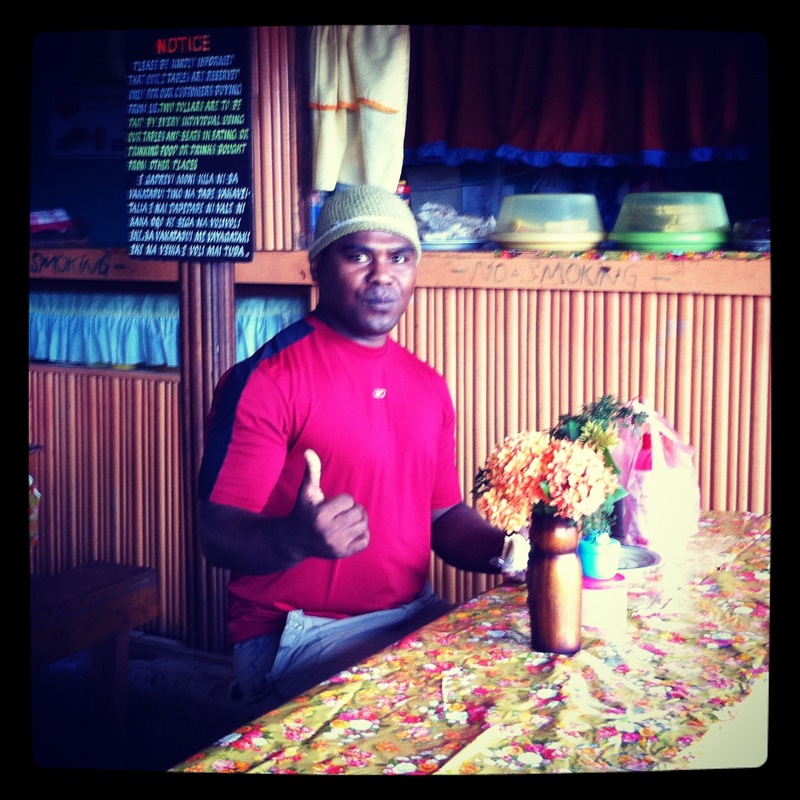 If you are taking small kids to Taveuni check out this website: Fiji magic. 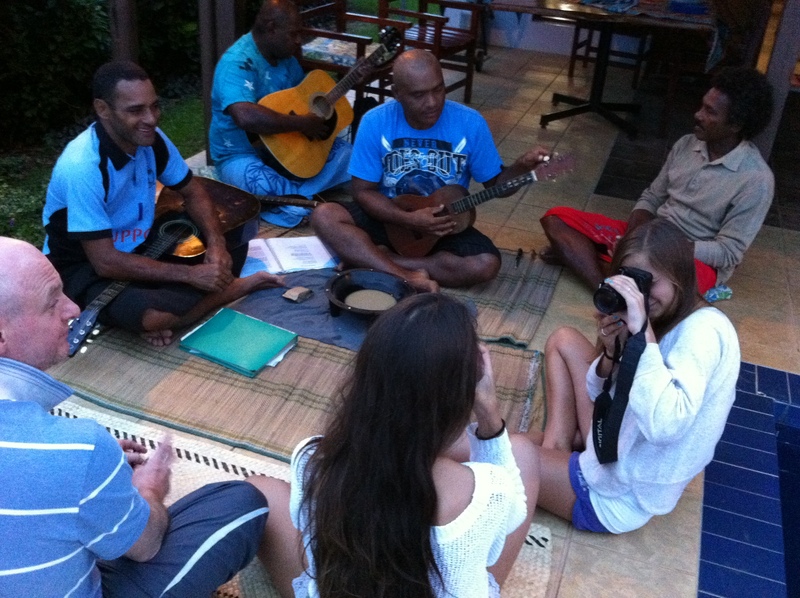 They have great stories about Fiji, personally I would print them out and use them as bed time tales. Below pictures of:Wairiki Mission & the inside of Villa Sekoula and the view from the villa’s lounge. Villa Sekoula is in Matei (north of the island). It’s a great village, super chilled. It has good snorkeling just off the coast and on the 2nd and 3rd Islands nearby. 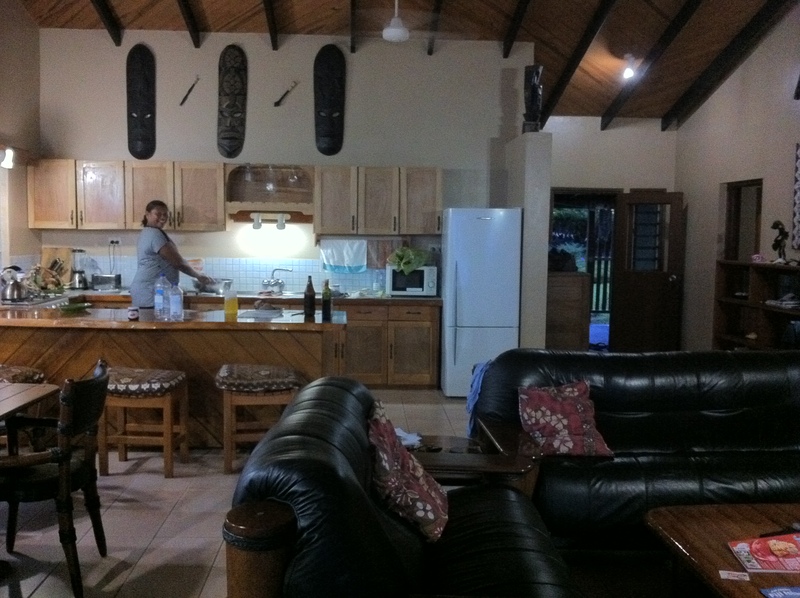 Our house came with kayaks so we would kayak and snorkel around the islands at leisure. If your looking for huge white sandy beaches, this isn’t the beach area for you. I met a tourist who raved about the Mananuca Islands as they had those kind of beaches. And what made this place extra special? The people! Below is a policeman! Also pictures of: houses in the local village and Seppo who cleaned our pool at the house and then turned up on the last night to make us a Lovo ( special meal cooked in the ground). His friends then arrived and we drank kava sitting on a straw mat on the floor, whilst they all sung and played music till midnight.